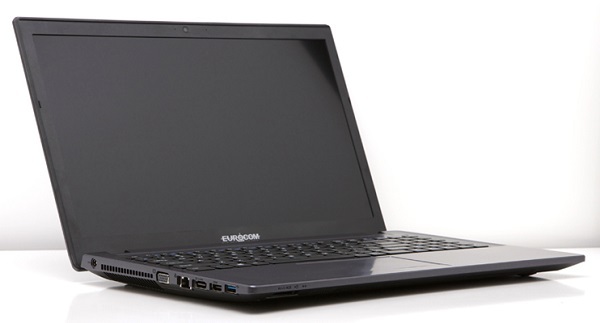 Eurocom is now launching the thin and light, 15.6” Electra 2 Notebook computer with TPM 1.2 hardware data encryption, NVIDIA GeForce GTX 850M graphics and 4th generation Intel Core i7 and i7 Extreme processors with 5 hours of battery life. “At Eurocom we consider both performance and security as something that goes hand in hand. Both of those requirements are critical even in entry level systems. Users must be provided a means to secure their hardware by encrypting all the files and personal information they have.” Mark Bialic Eurocom President. The supported NVIDIA GeForce GTX 850M graphics card has 640 CUDA cores running at 936 MHz+boost with 2 GB GDDR3 memory running at 2500 MHz with Optimus Technology for graphics performance when you want it and long battery life when you don’t. Get swept away by the beauty of the exquisite 15.6” IPS, matte display, which offers wide viewing angles, beautiful colour reproduction, great contrast and black levels. For users who require substantial amount of storage, the Electra 2 has support for three storage drives, with one mSATA, one 9.5mm standard drive bay and the third taking the place of the optical drive. A total of 4 TB of storage is currently offered. The increased security brought on by the Trusted Platform Module (TPM) 1.2 can save organizations and individuals in IT management and security costs. The integrate TPM 1.2 from Infineon Technologies ensures that digital certificates, passwords and keys are made more secure from software attacks and physical theft. TPM provides the ability for a computing system to run applications more secure and allows secured remote access to perform electronic transactions and communication more safely. The Electra 2 is fully configurable and upgradable, prices start at $825 usd and due to the customizable nature of the Electra 2 it can be configured with an Intel Core i7-4940MX processor, 16 GB DDR3-1866 memory, 1 TB Samsung 840 EVO mSATA SSD, two 800 GB Intel DC S3700 SSD, Windows 8.1 Professional and Intel Dual Band Wireless-AC 7260 for $7035. Powered by a full line of 4th Generation Intel Core i7 processors utilizing the Intel HM87 Express Chipset including the Intel Core i7-4940MX Processor Extreme with 4 cores and 8 threads running at 3.1 GHz (up to 4 GHz max turbo frequency) with 8 MB L3 cache. Up to 16 GB DDR3-1600 memory is supported via two slots.